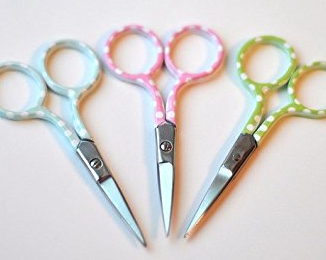 Polka Dot Scissors in teal. Embroidery scissors for cross stitch, lace, Hardanger, patchwork...perfect for removing those small thread ends. Quality stainless steel 9cm (3.5in). Polka Dot Scissors in teal. Great little scissors for cross stitch, lace, Hardanger, patchwork...perfect for removing those small thread ends. Quality stainless steel 9cm (3.5in).